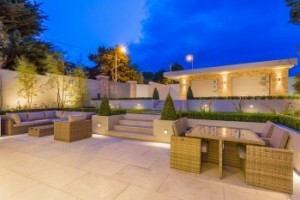 The gorgeous gardens of this beautiful house which is for sale in Foxrock, Dublin were designed by Garden Design Dublin. The gardens comprise three separate areas, the front, side and back gardens. All the gardens were designed in a very contemporary style, in line with the finish of the house, with clean sharp materials and straight lines with lovely complementary planting. The front garden was set off beautifully by a granite step and granite paving adjacent to the house, complementary cobbles and structured planting. This design frames the front of the house nicely and blends with the gravel finish over the rest of the driveway provided for parking and access. The back garden was transformed into an outdoor living space with generous spaces designed to fit an outdoor lounging set and dining table and chairs with the ground surface finished in contemporary egyptian limestone. Due to the significant slope on the rear garden it was divided into three different levels. The patio level nearest the house, the middle level finished as a lawn and the upper level where a garage was sited with a separate access to the adjacent main road. The levels were supported by plastered walls finished in off white to complement the clean finish of the rest of the design and paving. Two sets of wide steps provide access between the levels which together with a double row of stepping-stones across the lawn create an attractive feature within the garden design, particularly when viewed from the house. The side garden is finished in a similar design to the rear garden with staggered white walls supporting a raised border which runs along the side of the garden to support the higher level of the ground at the boundary. Cedar lath fencing runs horizontally along this boundary to provide an attractive modern backdrop which complements beautifully the rest of this contemporary garden design. Garden Design for a small garden can be just as challenging as that of a bigger garden. Space is more precious and the use of the space needs to be considered thoughtfully with a lot of competing requirements. 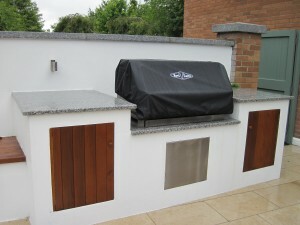 It is also very important to still give the garden design something special to provide that wow factor. 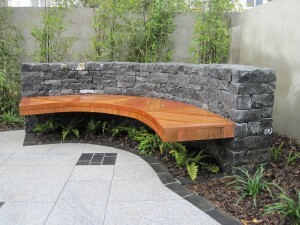 In this garden design we designed a Built-In curved wooden garden seat suspended invisibly from a rock wall, which sits neatly into the corner of the garden, to provide that special something. We have also left a planted area under the built-in garden seat for Ferns which together with the rest of the planting in this garden will give that luxuriant green feeling when mature. The wall was made from limestone which complimented nicely the cobble inserts and edging which we used to break up the curvaceous grey granite patio. The same building stone was used to face the rear of the house and a complimentary rectangular shaped raised bed set against the house. The clients still wanted a lawn for their dog to play on and to soften the hard landscaping, which was included but using artificial grass to reduce maintenance. They also needed a garden shed which we set into the least sunny corner of the garden, surrounded by planting. which will nicely camouflage it when mature. This garden was designed beautifully by Garden Design Dublin and expertly constructed by Davidstown Contracting and Landscaping. 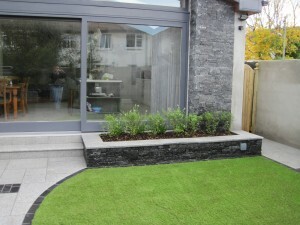 This modern garden design transformed a bare nearly square garden of a new build in a housing in Delgany, Co Wicklow into a wonderful relaxing garden to be enjoyed in all seasons. When we first saw this garden, it was only a square of lawn with a concrete patio adjacent to the house. 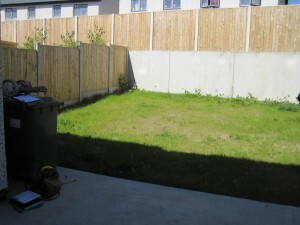 It was surrounded on three sides by new fencing but to the rear the fencing was on top of a concrete wall supporting overlooking houses behind and was not very attractive. Treatment of this wall was very important to ensure that the new garden had an attractive backdrop. To soften the square shape of the garden and to make it more relaxing to be within we used overlapping circles to create this garden design. The inner circle edges the scottish cobble border adjacent to the patio, the inner edge of the path to the shed and then cuts through the gravel bed and fire pit. The outer circle forms the outer edge of the path and the granite edging stone of the borders on the other two sides of the garden. Beautiful and hard-wearing granite was the main material used in the design, both for the generous patio adjacent to the house and the cobbles defining the edges in the garden design and forming the steps. 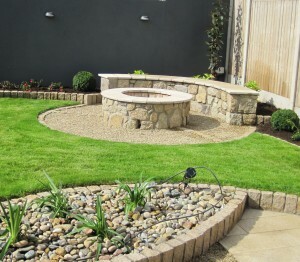 A wonderful fire pit made from granite stone with a matching semi circular built-in seat was positioned in the corner of the garden to add an attractive feature to the garden and to provide an enjoyable space for entertaining on cooler summer evenings. 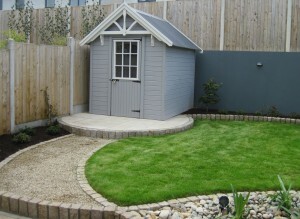 Finally, the Client had just purchased a very attractive garden shed, so rather than camouflaging the shed within the garden design we decided to make it a feature in the garden setting it off with some granite paving to the fore and complemented it with a newly plastered adjacent rear concrete wall which we painted a dark grey colour. Finally, to add an extra touch to the design we placed a bed filled with scottish cobbles and Agapanthus adjacent to the patio. 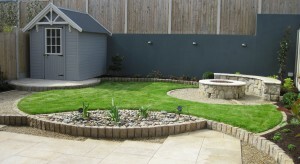 The mix of textures between all the materials really works and gives a lovely design touch to this great garden design. 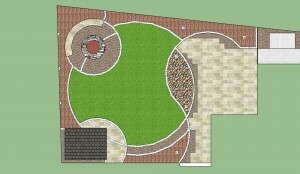 This garden design looks gorgeous now but the planing is immature. We are really looking forward to seeing how it looks in a few years time with more mature planting. 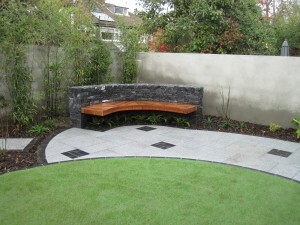 Beautifully design by Garden Design Dublin and expertly built by DJ Landscapes. This contemporary garden design transformed an old patio area into an outdoor room using modern materials and sharp lines to produce a patio which is a wonderful compliment to a beautiful home. The garden design extends the house out into the garden and provides space for relaxation, BBQing and dining. 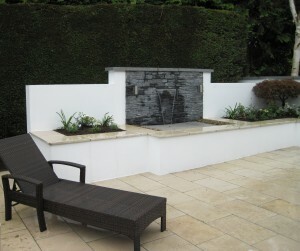 A water feature set into a rock finished wall forms a focal point within the garden design which is set into an L shaped wall and flanked by raised beds filled with flowering plants. The patio finished in Egyptian limestone provides a generous space for a dining table and chairs set beside a built-in BBQ for outdoor cooking and entertaining. For enjoyment on cool summer evenings the garden design has a Fire Pit finished in matching rock positioned surrounded on two sides by built-in seating. 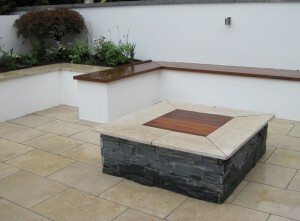 The top of the Fire Pit has been fitted with a removal cover to allow it to double as a coffee table when not in use.